This leafy retreat in Siem Reap straddles the two very exciting worlds at play in this part of Cambodia. Launch your otherworldly adventure into ancient Angkor Wat then discover the bustling markets, restaurants and boutiques in the thriving town centre. Angkor Wat is quite literally heaven on earth. For Hindus, the temples were built as an earthly representation of Mount Meru, the centre of all physical, metaphysical and spiritual universes. Dating back to the 7th century and 600 years in the making, it is a magical complex filled with hundreds of sacred ruins. As the largest religious monument in the world, Angkor Wat remains a site of pilgrimage for Cambodians and global travellers. Belmond La Résidence d’Angkor was one of the first luxury hotels to open in Siem Reap, after the Khmer Rouge regime fell in 1998 and Cambodia began to open up to the world. Today, Belmond’s coveted position on the Siem Reap River is just a stone’s throw from Angkor Wat. While the temple welcomes over two million visitors a year, our hotel puts you right at the heart of this exciting town, offering an oasis of calm within the colourful buzz. You’ll find us perched along the banks of a tree-lined river, surrounded by lush tropical gardens. Through a discreet entrance in the bustling centre of Siem Reap, across a wooden bridge that spans a tropical pool, our majestic haven awaits. The hotel perfectly weaves the natural into the man-made, the traditional into the contemporary. 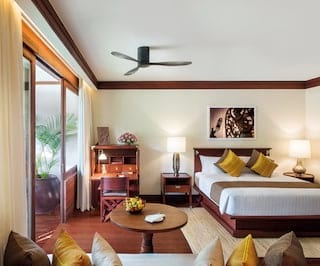 Built with natural woods in traditional Khmer style, our suites spread out among the tropical flora and fauna. Each features a large alfresco terrace, the perfect spot to sit back and unwind. Inside you’ll find hand-woven jewel-toned silks, traditionally carved hardwood furnishings and bespoke artworks from internationally-recognised contemporary Cambodian artists. After spending the day exploring Angkor Wat, retreat to the salt-water pool before heading to our multi-award winning Kong Kea Spa. Try the bamboo massage, a head to toe coconut therapy, or a mango-based treatment if you visit in season. “Absorb the good energy from nature and return any bad to the earth,” advises spa manager Lackhena Chum. While the hotel is a mere ten-minute walk from Siem Reap’s Old Market and entertainment district, guests can sample the hawker-style food stations at our very own Spice Circle. Our acclaimed chefs serve creative Khmer and Cambodian dishes. We even have a colourful tuk tuk reborn as a salad station. Our hotel exists to embrace you into Cambodian traditions. Explore the national treasure of Angkor Wat and experience lively Siem Reap before heading back to your Khmer home. We look forward to hearing tales of your adventures.